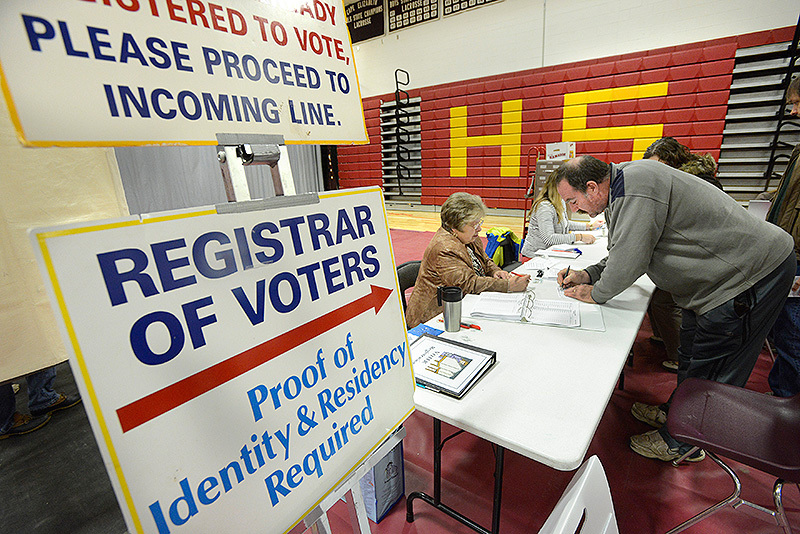 Contentious races and issues on the state and local levels are drawing voters to the polls in large numbers. 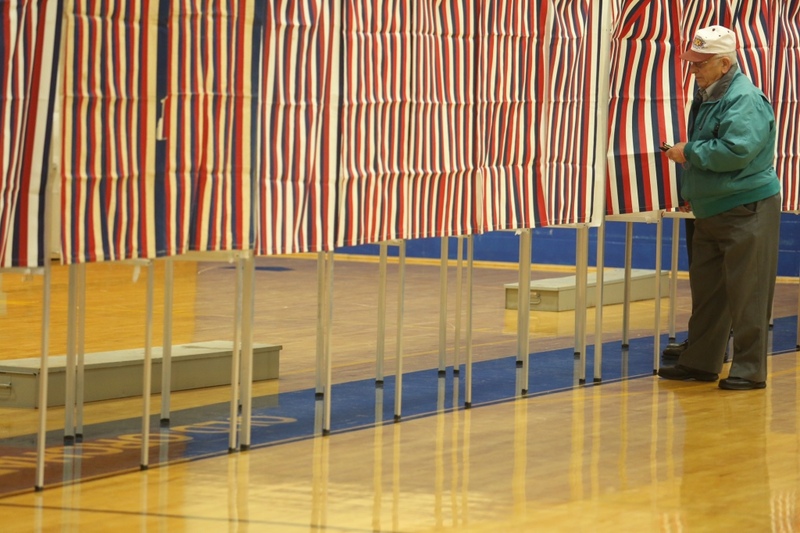 Maine’s top election official said Tuesday evening that he expects voter turnout between 55 percent and 60 percent for federal, state and local elections being held across the state. 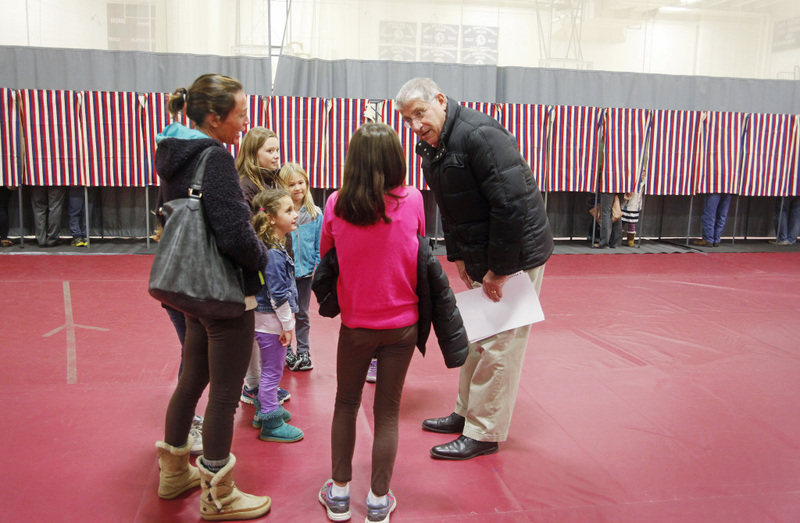 Secretary of State Matt Dunlap said he visited polling places in Waterville, Vassalboro and Portland by midday Tuesday and found turnout strong at all of them. 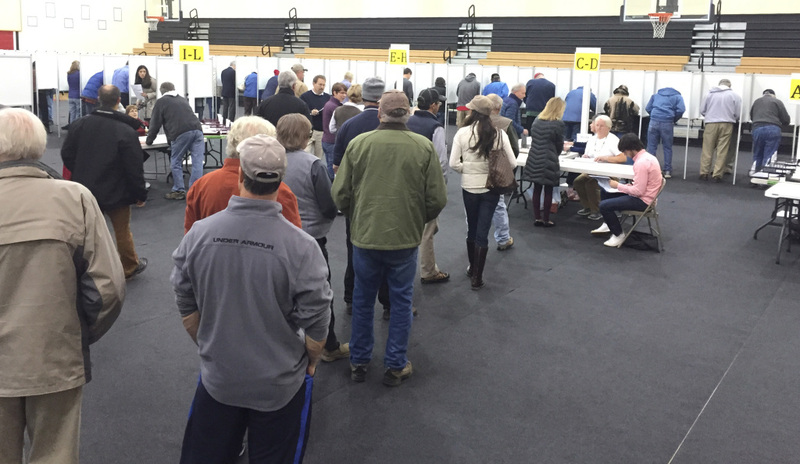 He said that officials in his hometown of Old Town said voters were coming in at a clip of 200 an hour. 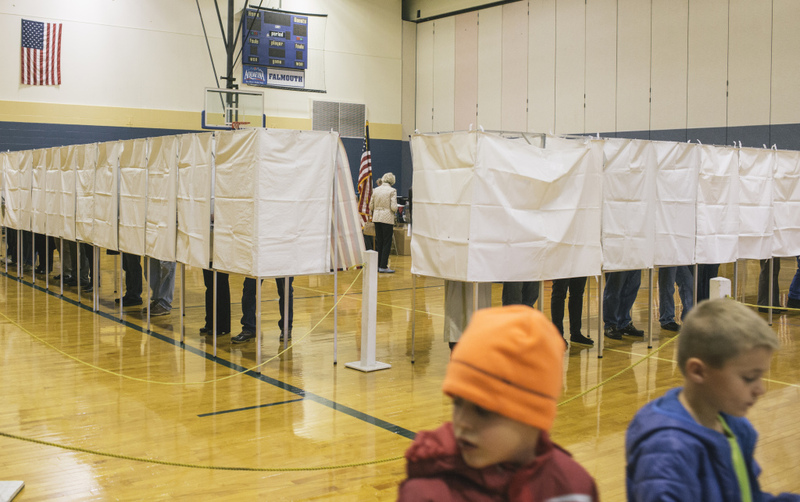 Voters are settling hard-fought campaigns for governor, senator, congressional representatives and state offices. 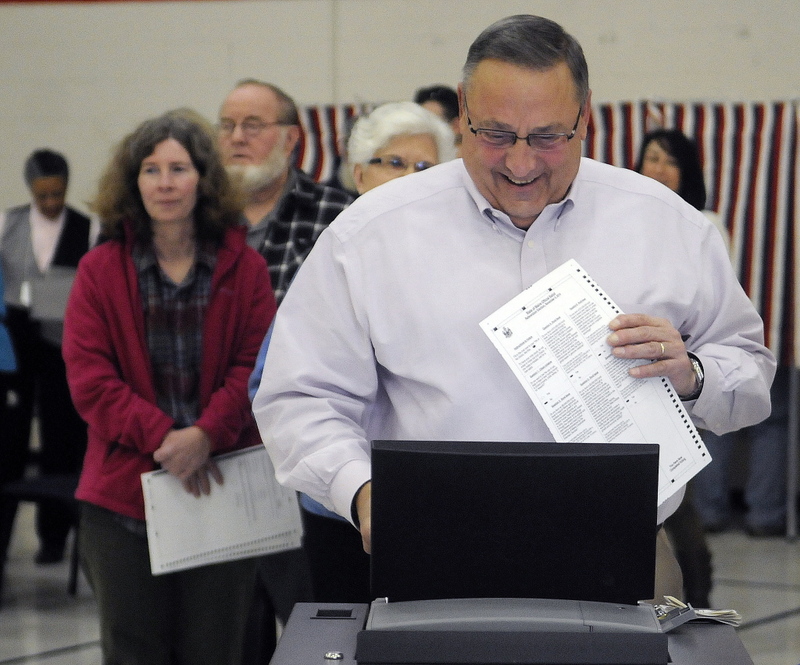 The top-of-the-ballot race is for governor, with Republican Gov. 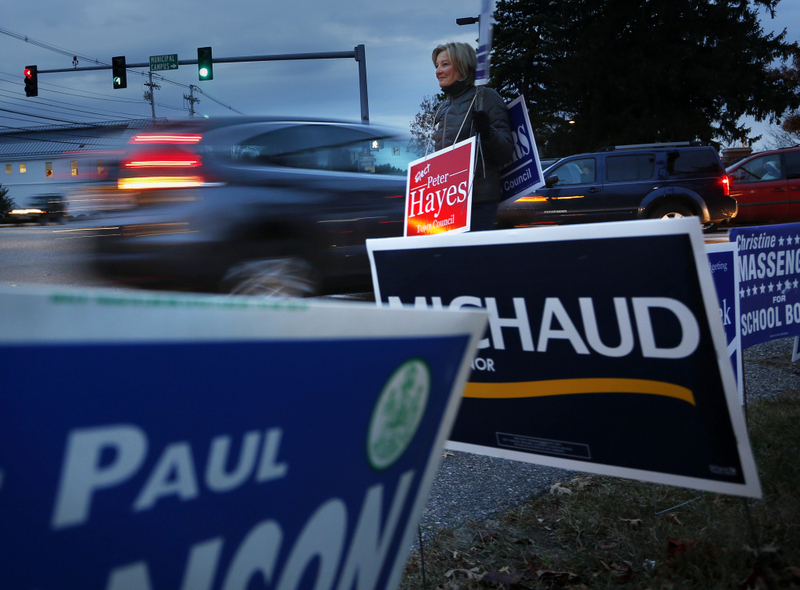 Paul LePage facing Democratic U.S. Rep. Mike Michaud and independent Eliot Cutler. 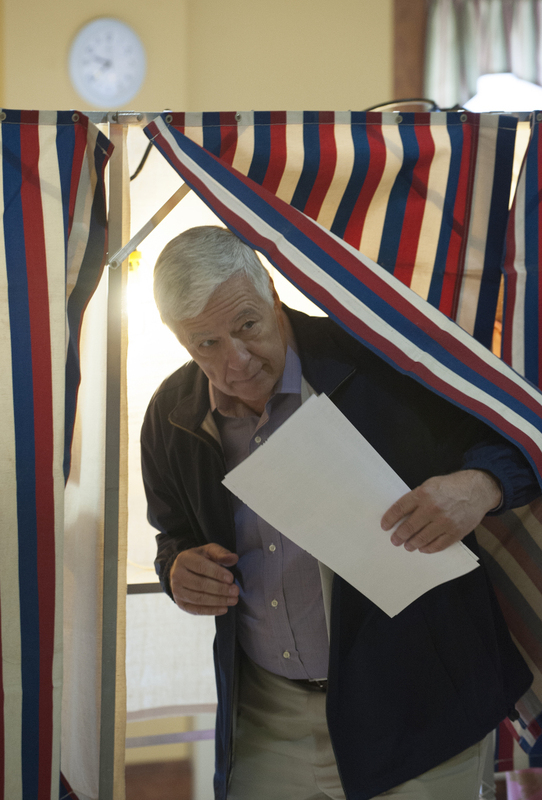 Democrats have tried to make it a referendum on the controversial LePage, while the governor has characterized Michaud as “an empty suit” who won’t tackle tough problems. 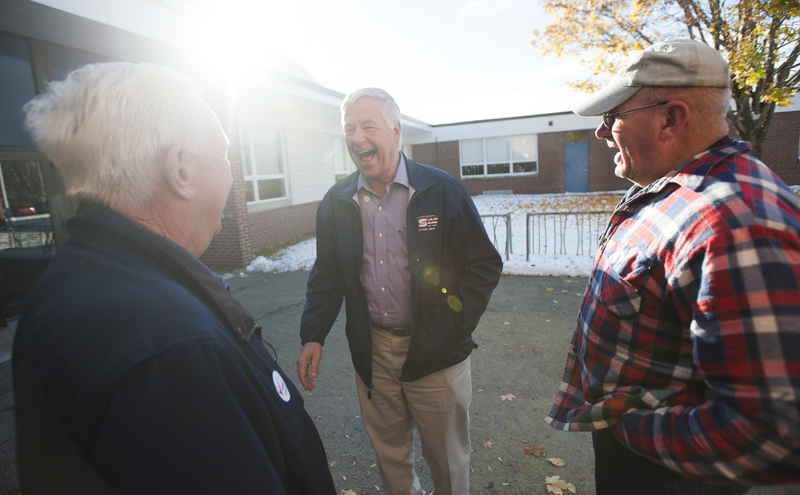 Cutler has criticized both LePage and Michaud, but confused voters with a press conference last week in which he told supporters who don’t think he can win to vote for either of his opponents, but then stayed in the race. 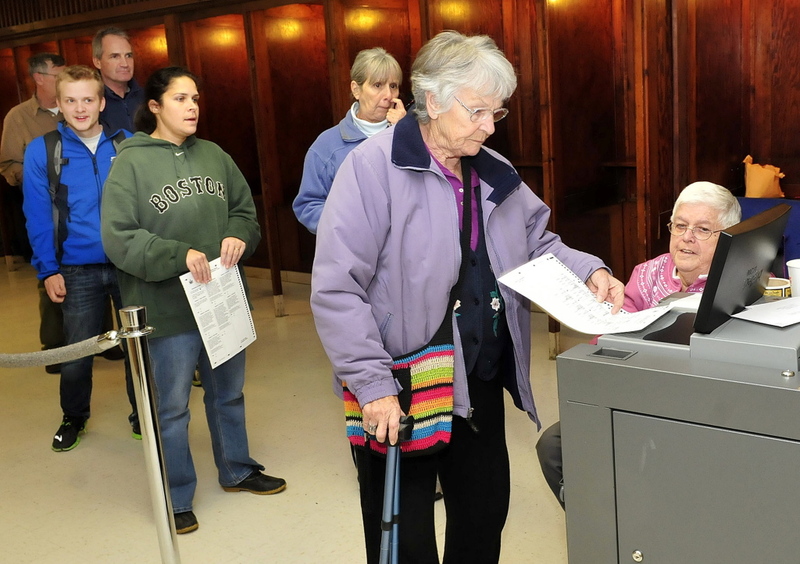 Maine traditionally has one of the highest rates of voter turnout nationally. 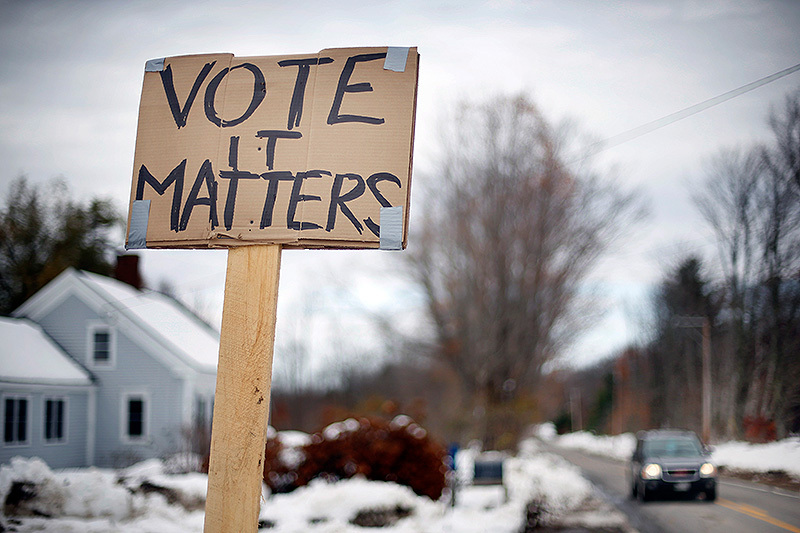 In the last gubernatorial election, in 2010, 56.2 percent of Maine’s eligible voters cast ballots, tops in the nation. 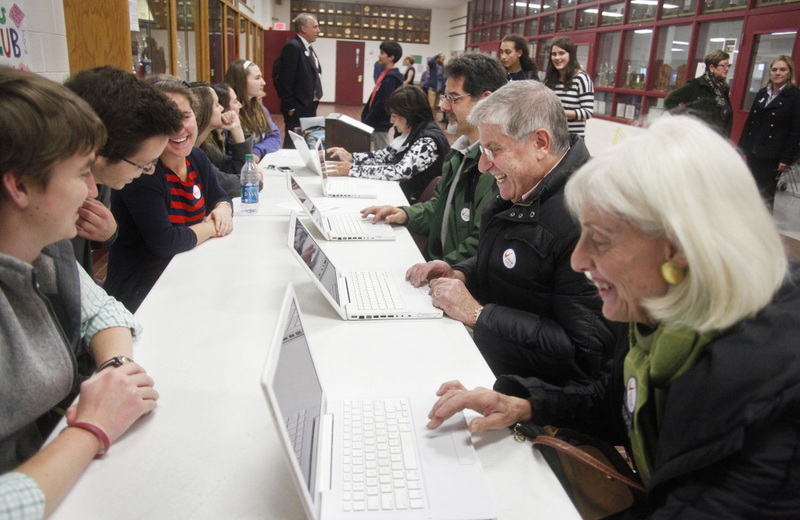 Before this year’s election, Dunlap predicted turnout would be 53 percent to 57 percent. 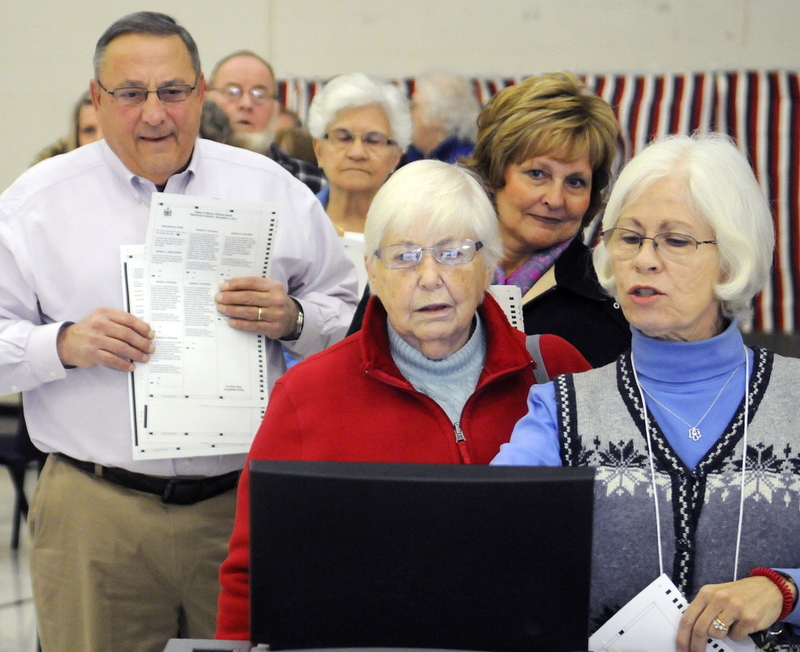 About 5.5 percent of Maine’s nearly 964,000 eligible voters cast ballots before Tuesday, slightly ahead of the early-voting pace in 2010, his office said. 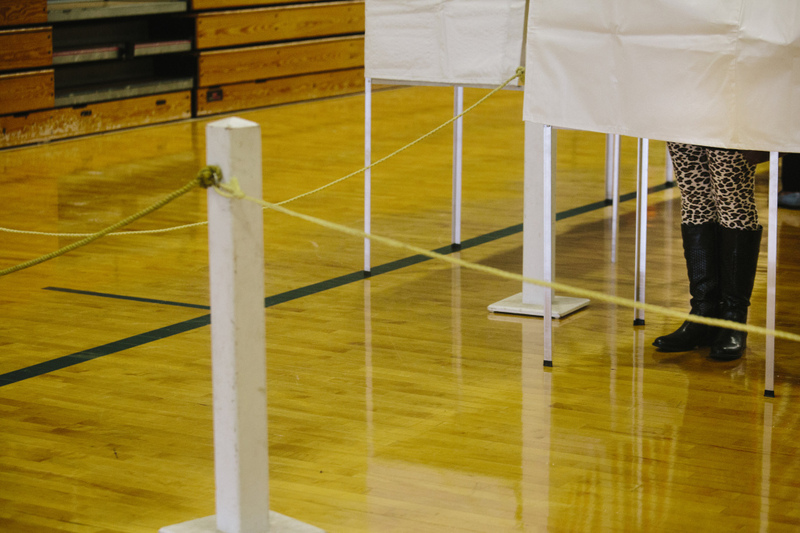 Nationally, several polls show that Republicans have a good chance of taking control of the U.S. Senate, with those races considered a de facto referendum on President Obama, whose disapproval rating is high. 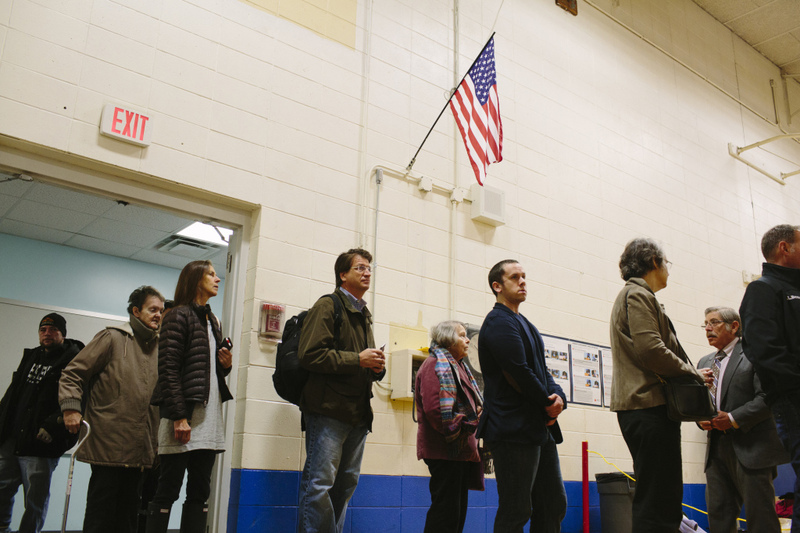 The outcome will shape the fate of Obama’s agenda for the rest of his term. And everything else that Congress wants to do, or stop from getting done. 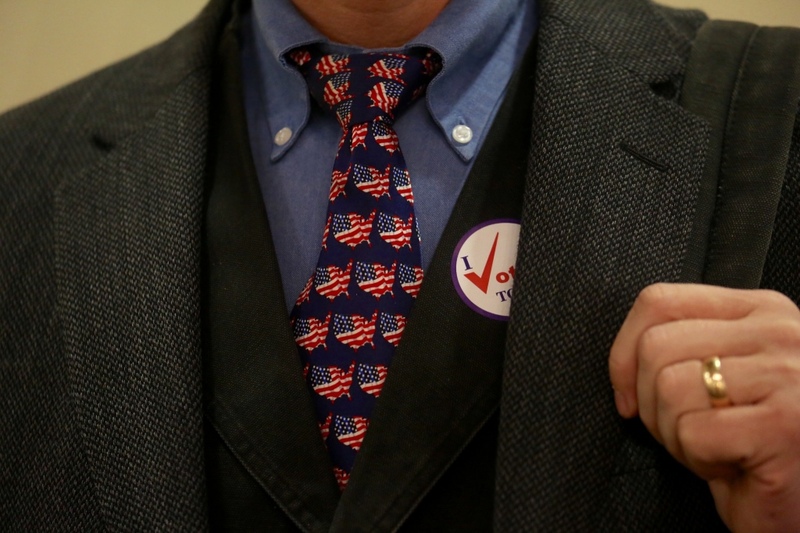 Republicans must gain six seats to win back the Senate majority they lost in 2006. 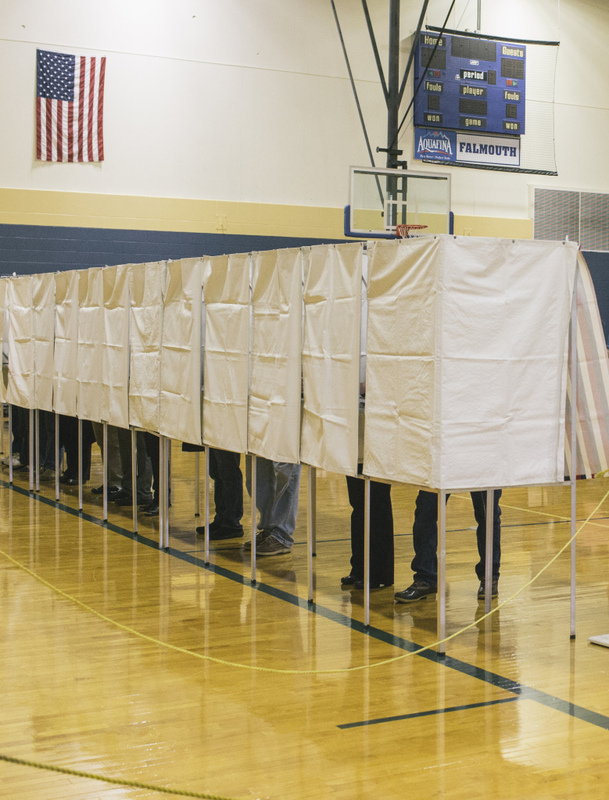 Polls and pundits see about 10 Democratic seats that could switch to the GOP. 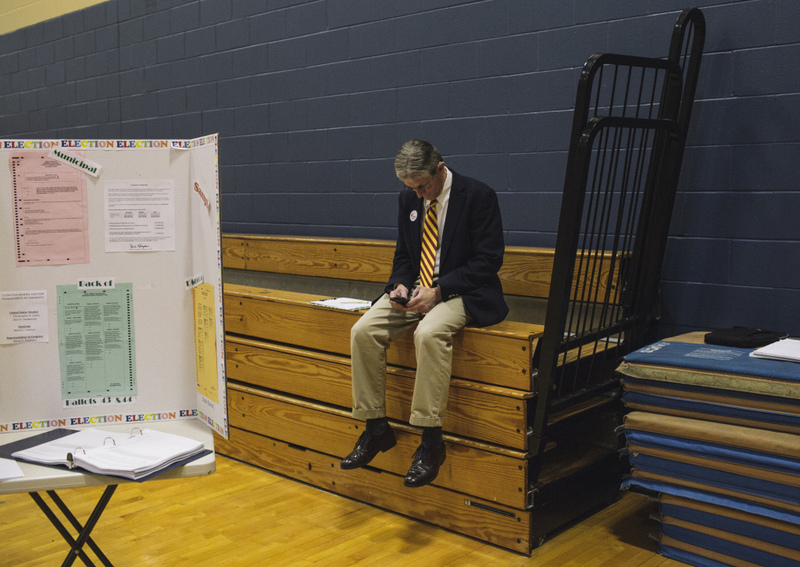 Democrats could flip a GOP seat, too, or perhaps as many as three. 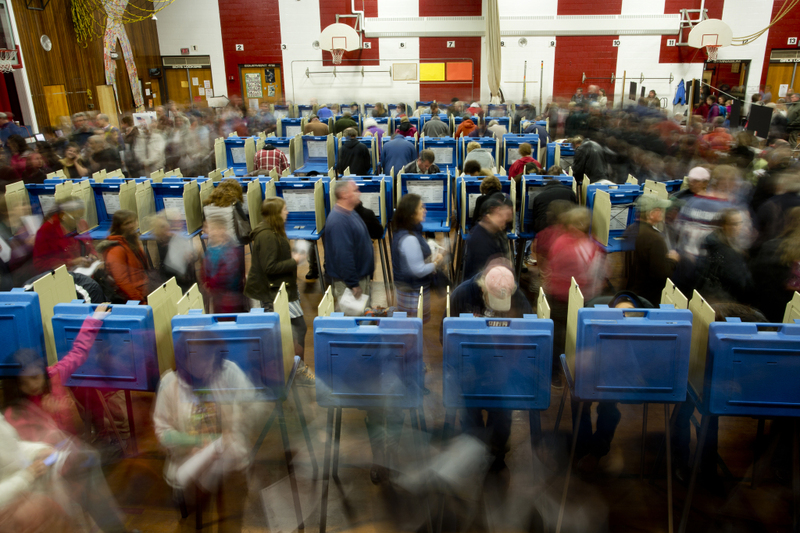 Voters across the country will also pick a new House of Representatives, choose governors in three dozen states and decide more than 100 ballot measures. 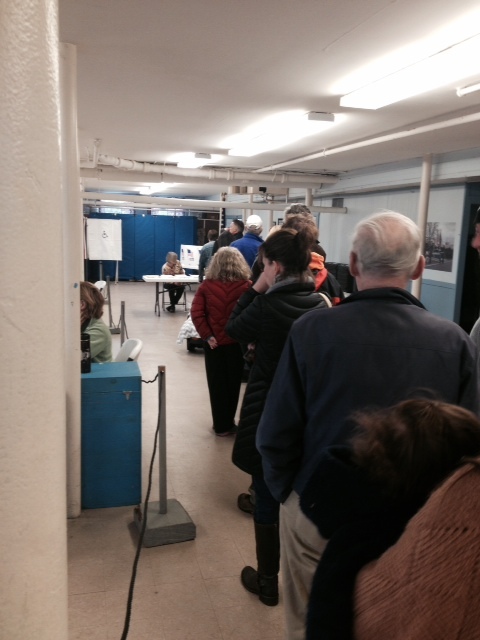 In Maine on Tuesday, Brunswick officials were swamped from the time the polls opened in the morning. 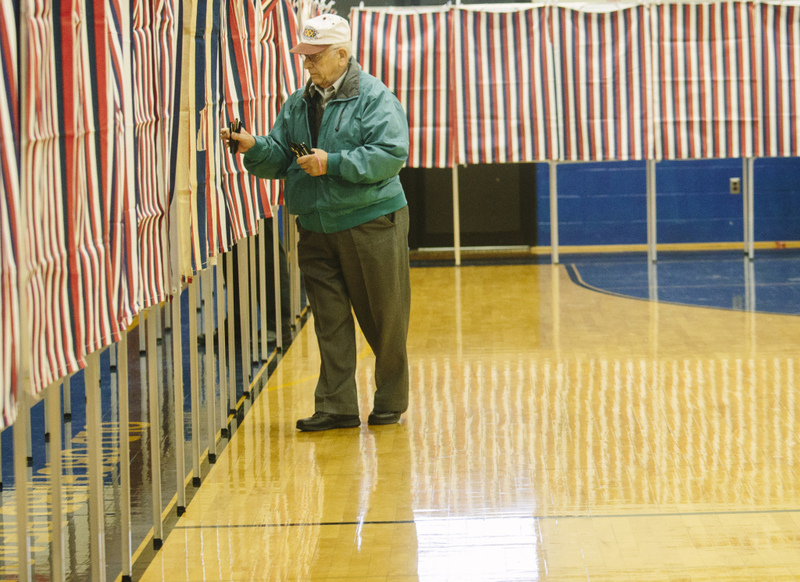 One resident sent a text message to say that voters were waiting as long as 40 minutes just to get into Brunswick Junior High School, the town’s only polling place this year. 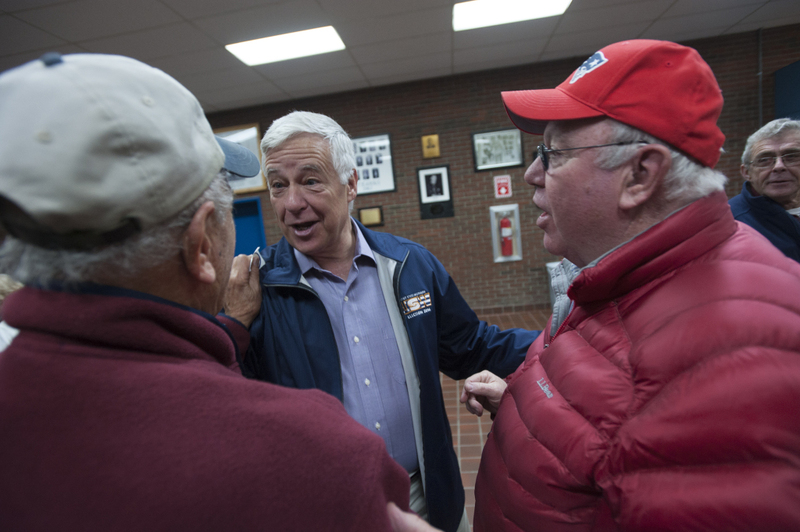 Michaud’s campaign spokeswoman, Lizzy Reinholt, said the campaign was delivering pizza, hot cocoa and candy to voters who faced an hour wait to vote in Brunswick. 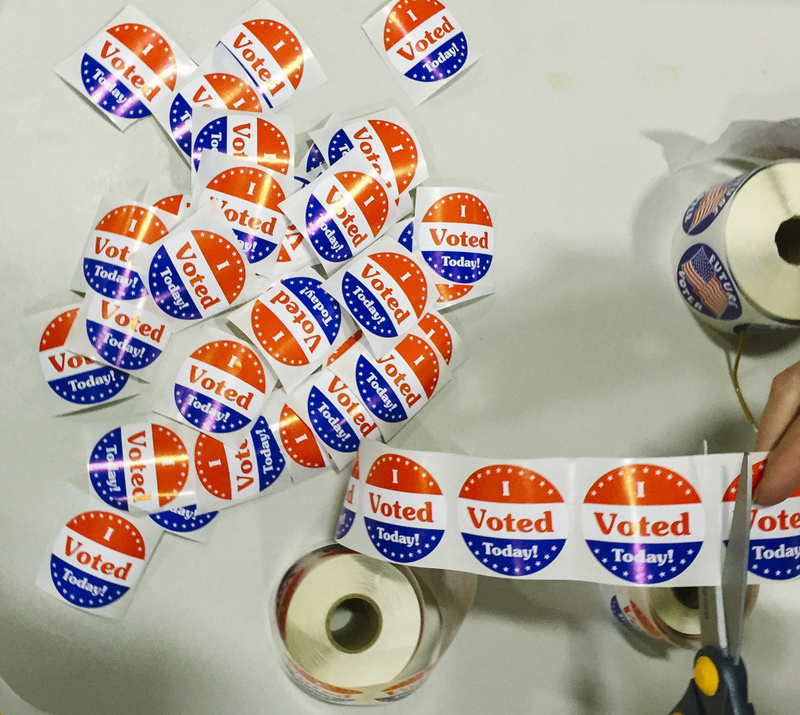 In Augusta, election officials ran out of ballots Tuesday afternoon and had to replenish their supply. 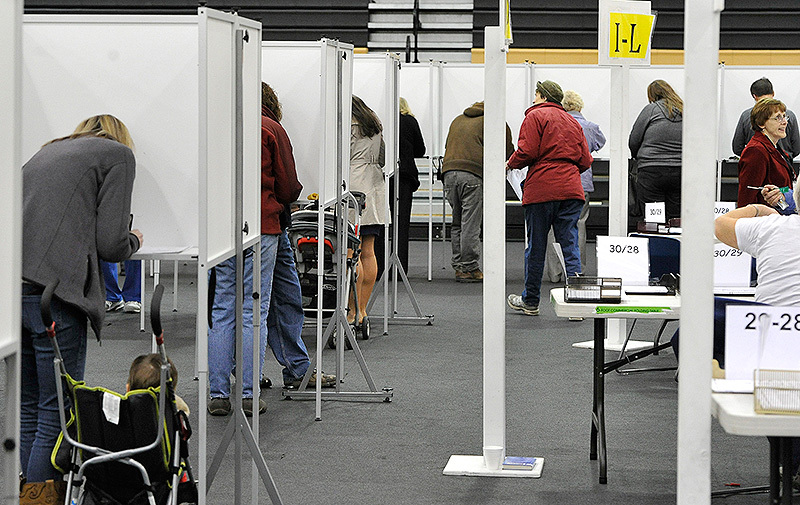 Nearly 400 voters cast ballots in the first two hours in Buxton, where polls opened at 5 a.m. Buxton residents had an interesting option to go along with their “I Voted” stickers: flu shots. 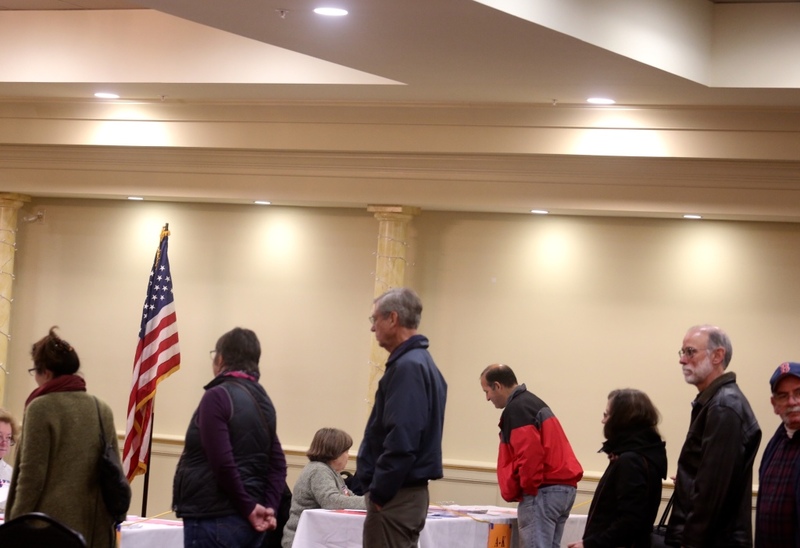 Hannaford pharmacists set up a clinic at Town Hall to provide flu shots throughout the day, a first-time offering for Buxton. 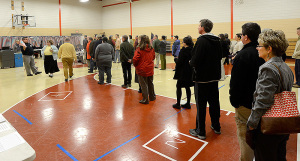 In Wells, voters reported long lines at various times during the day as residents cast votes at the junior high school. 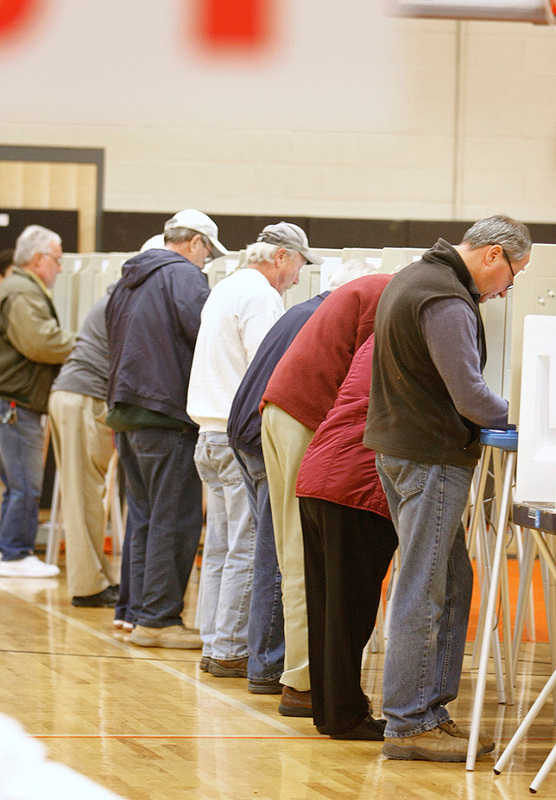 Voting is usually held at the high school, but it was moved because of construction. 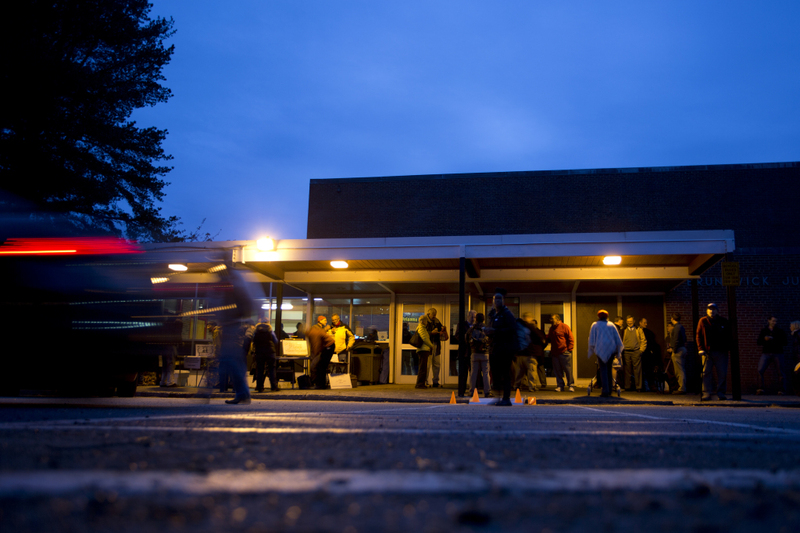 Voters stood in line at Portland’s Reiche elementary school, where election officials ran out of their “I Voted” stickers before 9 a.m., though the stickers were restocked later in the morning. 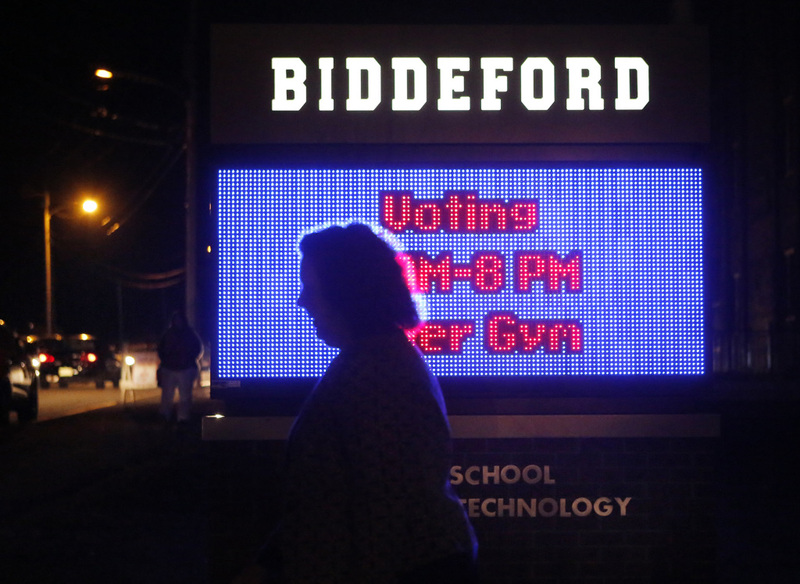 In Biddeford, where polling places were consolidated from three to one, the Biddeford High School parking lots were full all morning and some voters complained about not being able to park closer to the school. 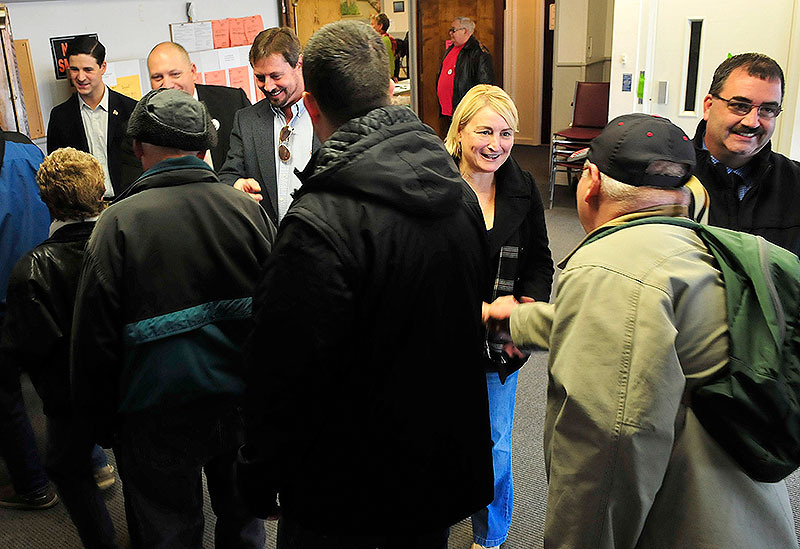 Secretary of State Matt Dunlap went to Waterville on Election Day to observe voting at the Bourque Lanigan American Legion. 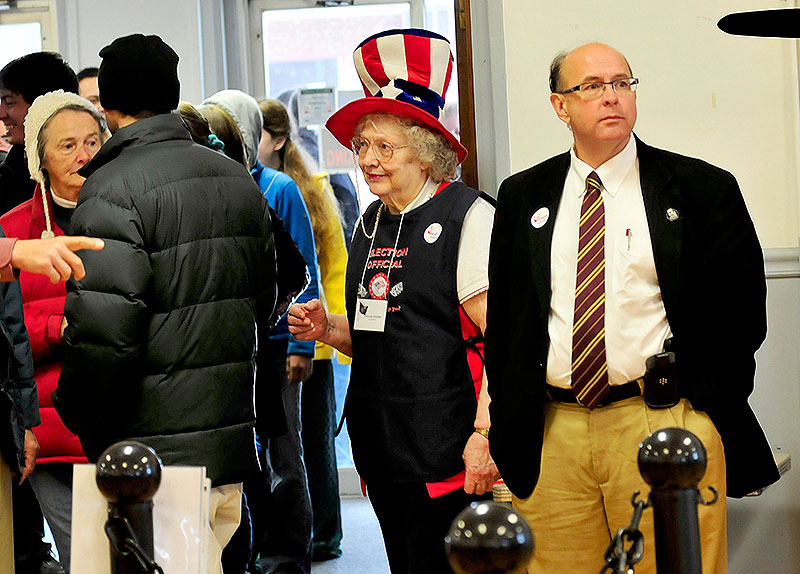 At left is election clerk Germaine Gooldrup. 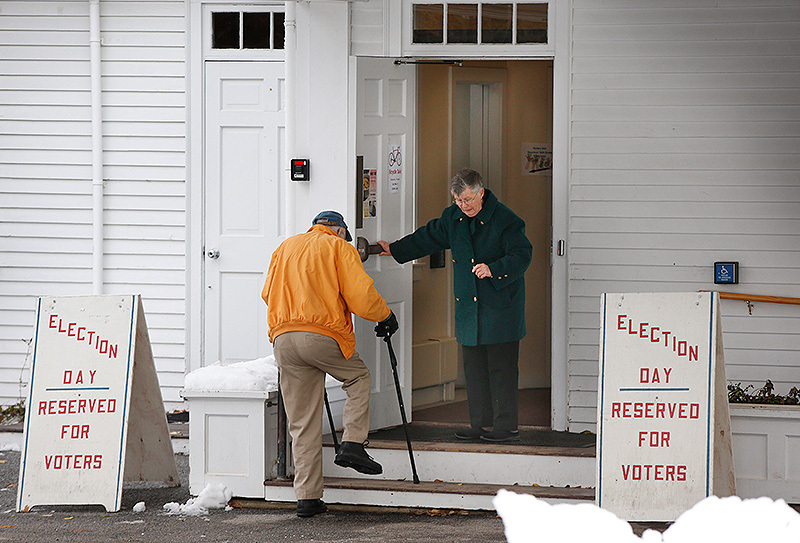 In midcoast Maine, voters had to search out polling locations because the traditional spots had been knocked off line by Sunday’s wind and snowstorm. 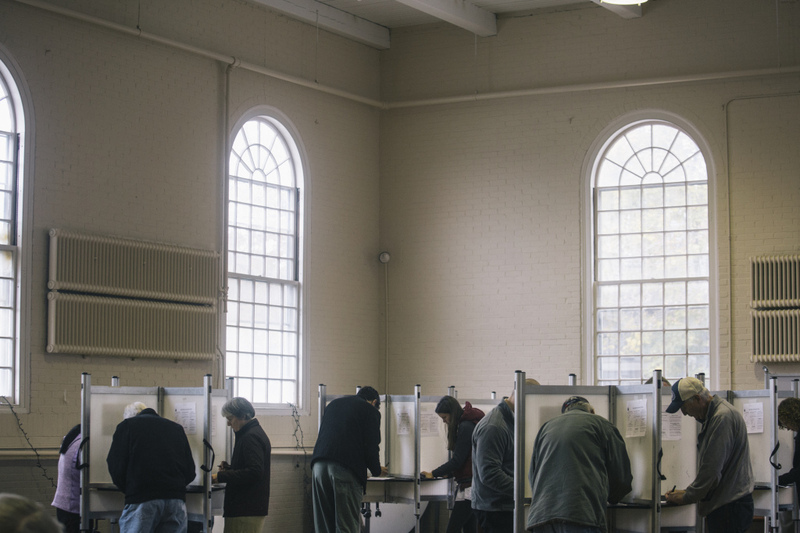 At least five towns – Brooklin, Camden, Mount Desert Island, Rockland and Swans Island – had to change polling places because of power failures. 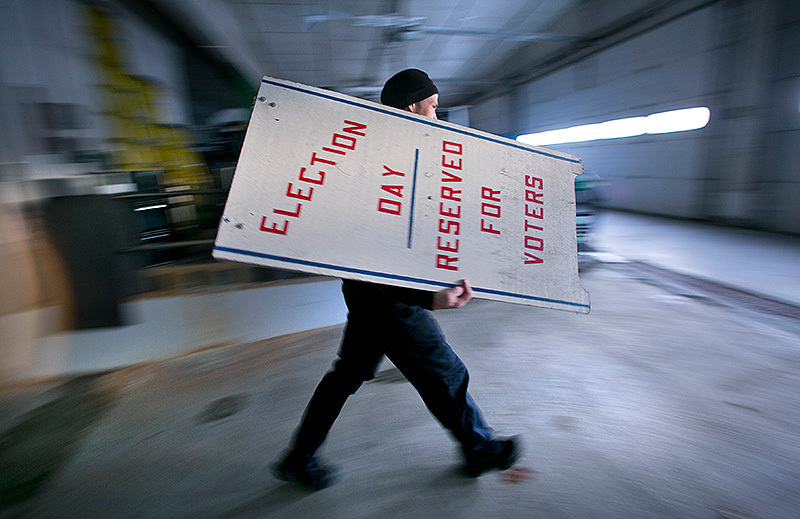 An emergency declaration allowed utility workers to vote from the field. 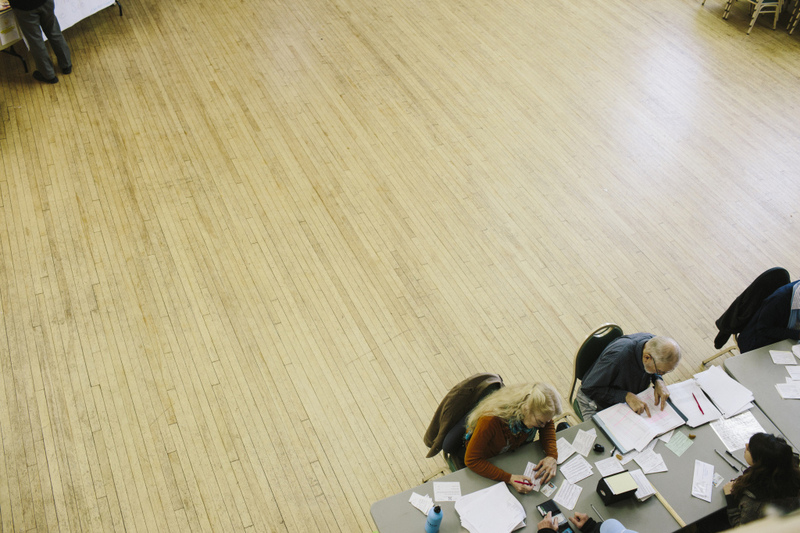 The workers could download ballots, mark them and then scan and email them back to the state, which made sure the ballots were counted in the proper town and precinct. 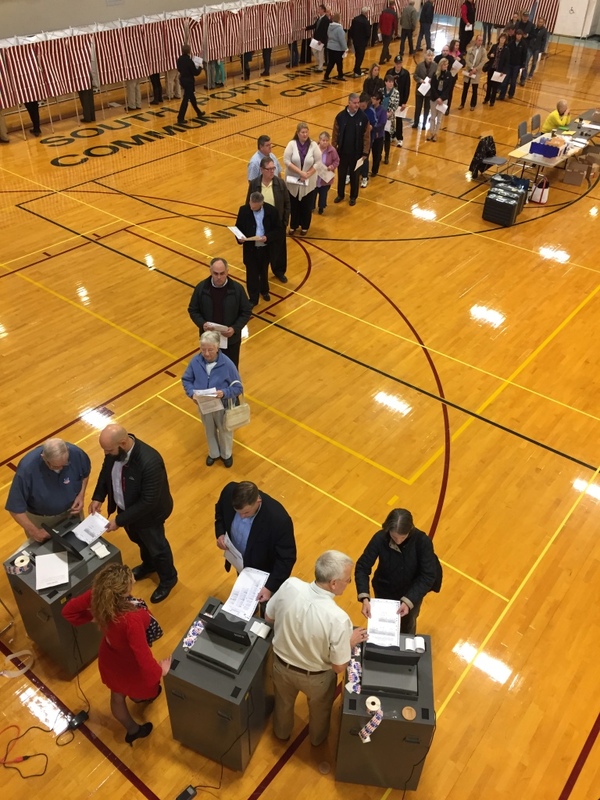 Dunlap said the system could help ensure that hundreds of utility workers’ votes got counted, even as they worked to restore power in parts of the state that were hit hard by the storm. He said he didn’t know how many utility workers used the system. 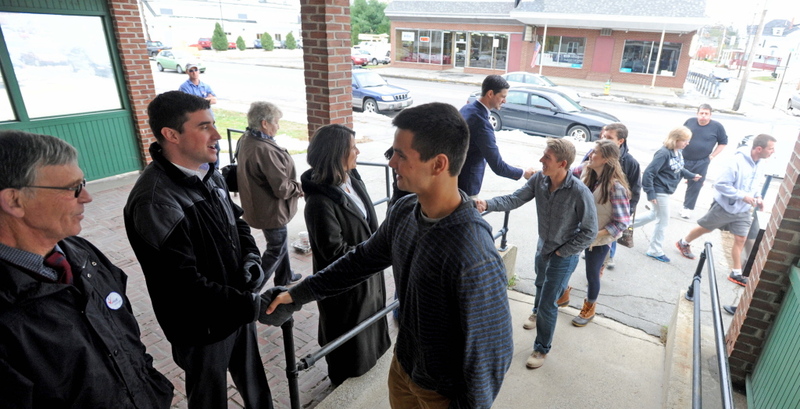 In many small towns, the campaign won’t end until the polls close at 8 p.m.: In Berwick, for instance, both candidates for the state Senate were trying to attract anyone who still hadn’t decided, with Democratic incumbent Joshua Plante and his Republican challenger, Beth O’Connor, both greeting voters, on opposite sides of the walkway leading into Town Hall. 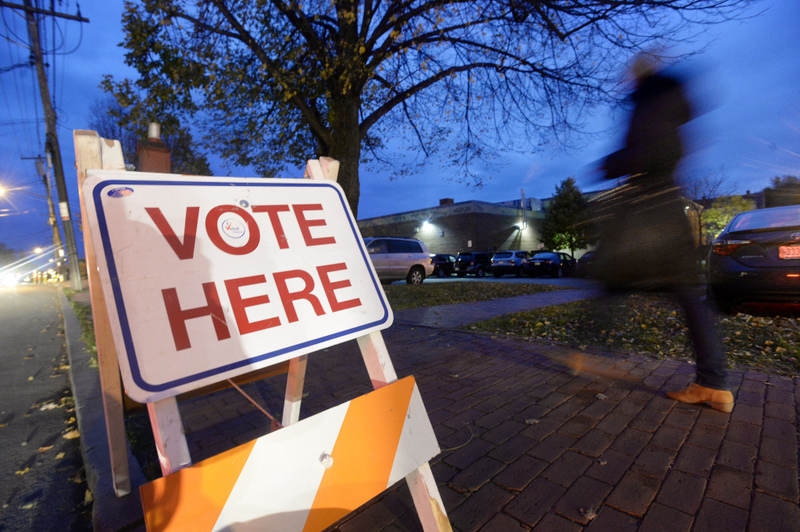 Berwick voters also faced several local issues, including proposals to allow Sunday beer sales and to clean up the closed Prime Tanning Co. site. 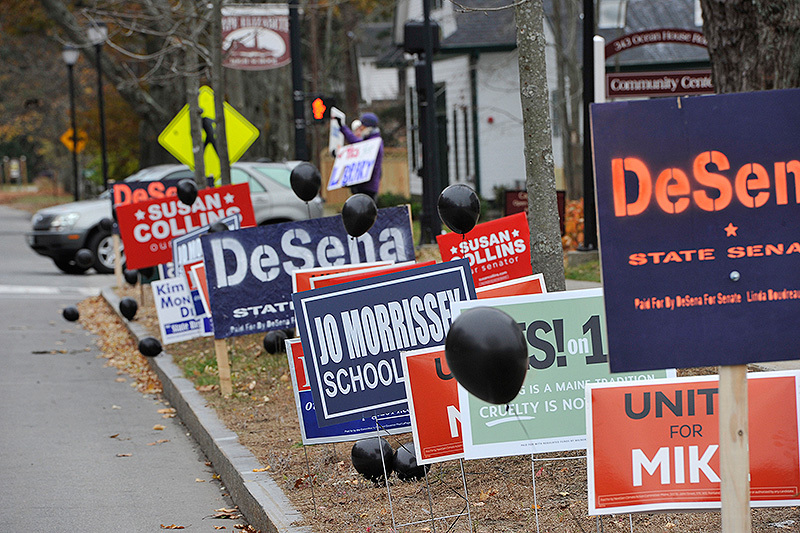 On Tuesday morning, Cutler supporters were still out, waving campaign signs in South Portland and Freeport. 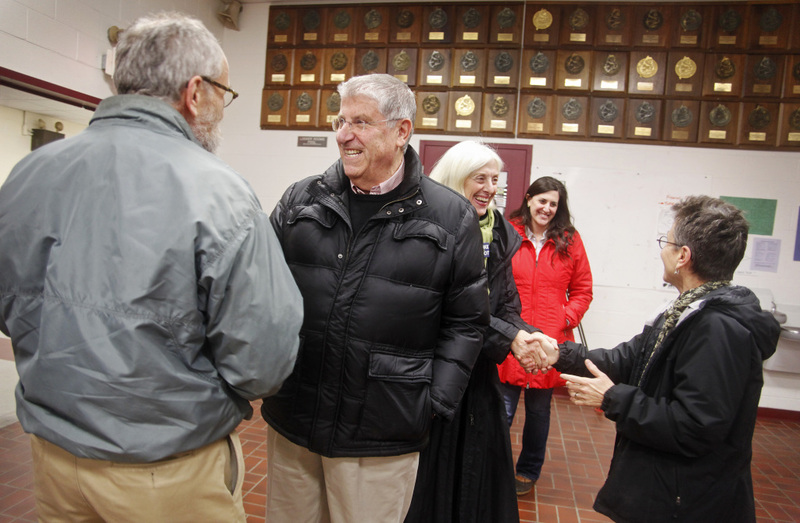 Cutler greeted voters at South Portland’s Community Center, including two sisters who told him about their cat, Eliot. Another girl fist-bumped the candidate after telling Culter that she voted for him in the mock election at Dyer Elementary School. 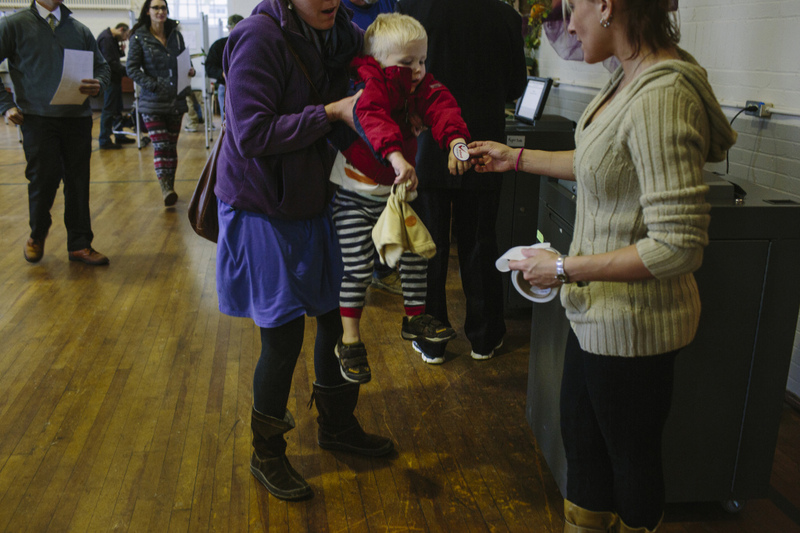 District 1 Warden Philip Gaven (left) hands out sample ballots to people waiting to vote at the Boys and Girls Clubs in South Portland. 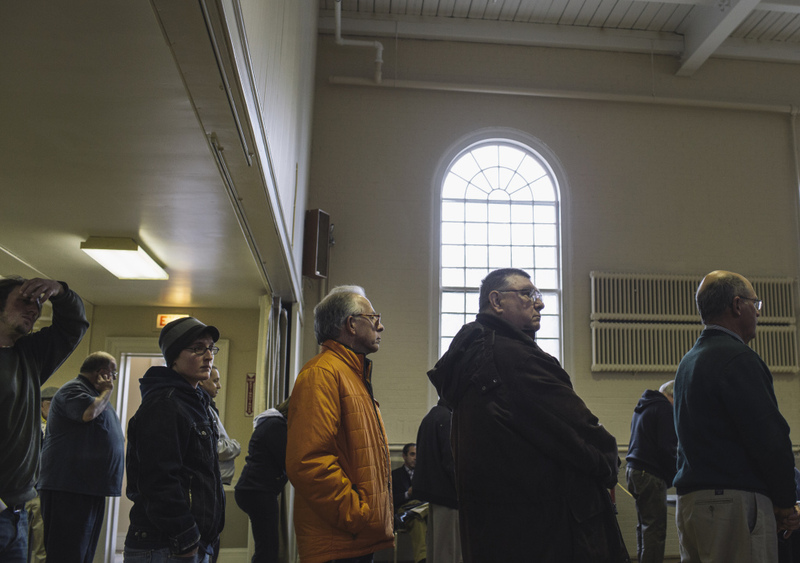 The governor’s race drew Annelissa Leveque, 56, to her polling place at the Boys and Girls Club on Broadway in South Portland a half-hour before the doors opened at 7 a.m. Tuesday. 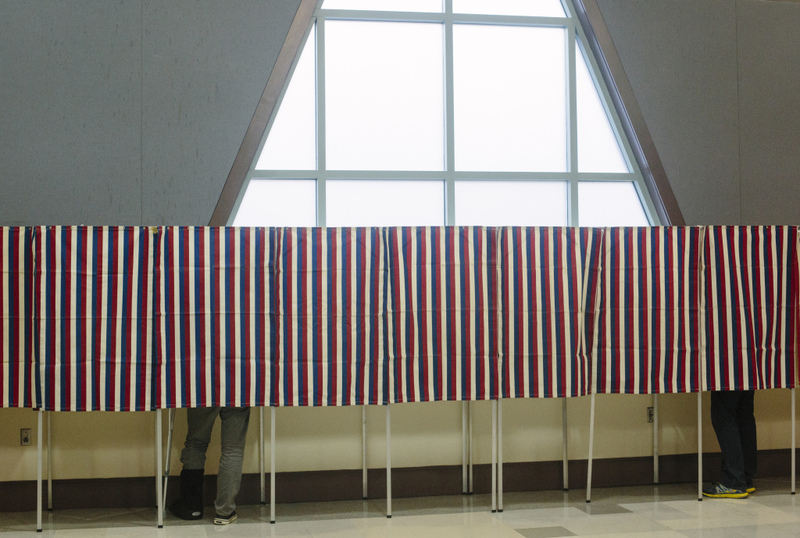 “I don’t think Cutler has a chance and I don’t like that LePage doesn’t try to work together to get things done,” Leveque said. 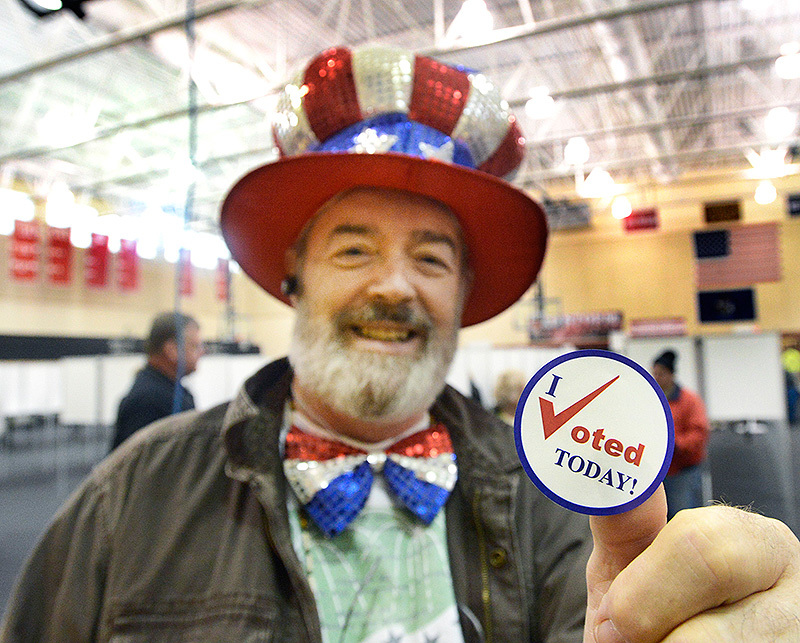 Tom Whitehead, 55, said he, too, would vote for the Democratic challenger, although he wasn’t enthusiastic. 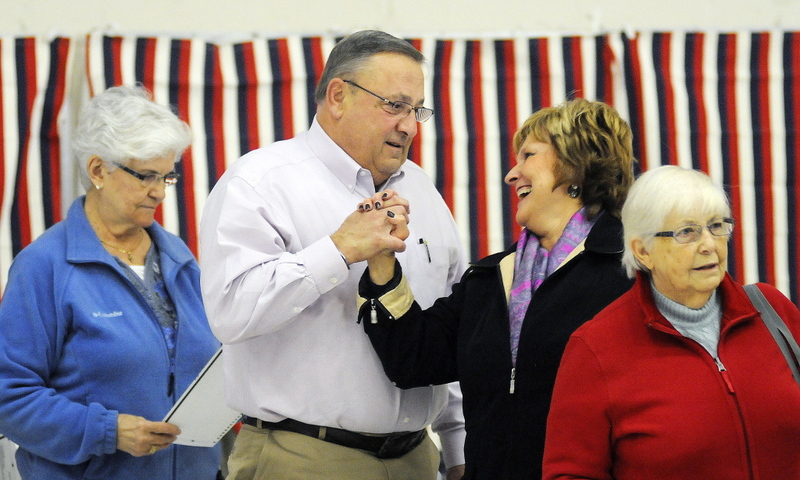 But LePage was drawing support in Gardiner, where Paul Marsella, a Republican, said the incumbent needs four more years after being “blocked” by Democrats in his first term. 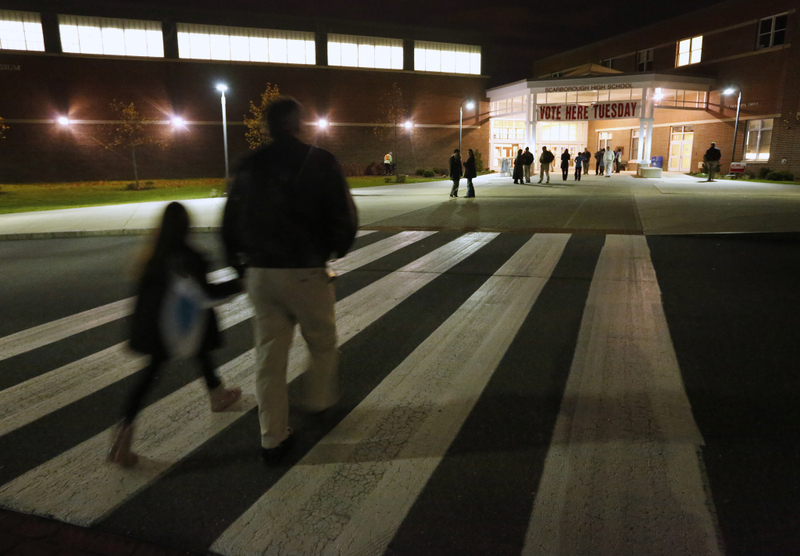 At Falmouth High School, Meg Hurdman said she voted for LePage because she thinks he has a better plan to grow Maine’s economy. 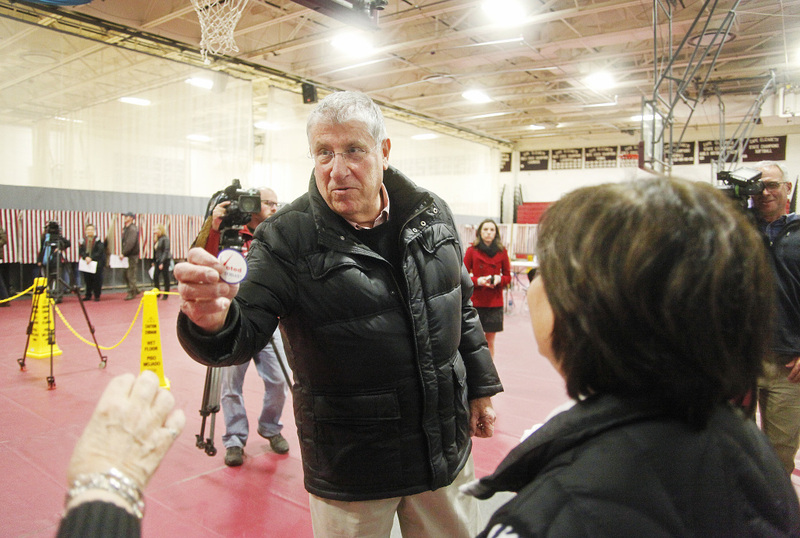 But Ralph Warnock, who also voted at Falmouth High School, said he went to the polls Tuesday mostly because he wanted to help “defeat Paul LePage.” Warnock, 53, who isn’t affiliated with a political party, said he had been planning to vote for Cutler, but getting LePage out of office is more important to him than voting for his first choice. 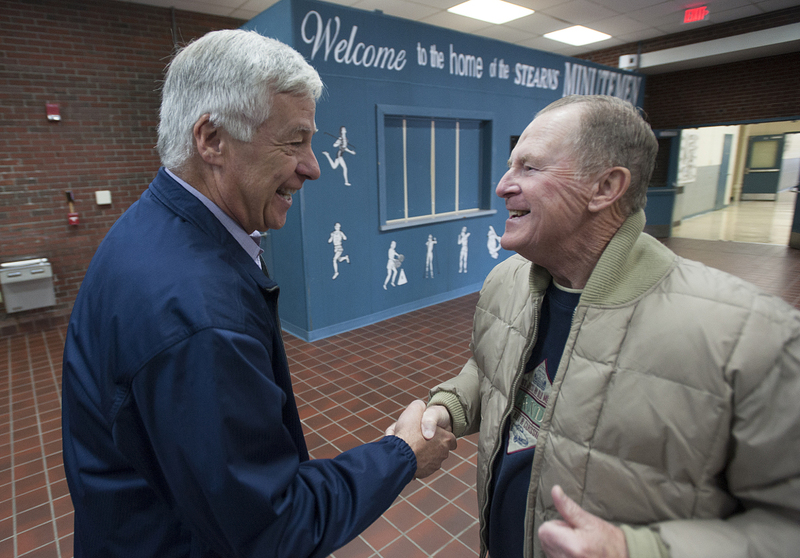 “I like Cutler, I like the fact that he doesn’t take (political action committee) money, and I don’t like the fact that Michaud has taken money from (agricultural corporation) Monsanto,” said Warnock. 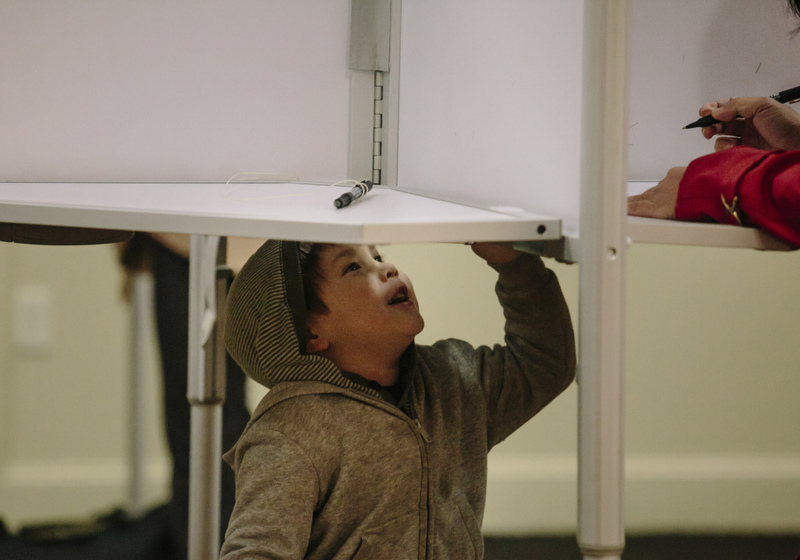 He added that he wanted to cast a vote against Republican U.S. Sen. Susan Collins, and for Democratic challenger Shenna Bellows, because Collins too often sides with the conservative elements of the Republican Party. “I know she does pose as a moderate, but her votes contribute to the dysfunctional Congress,” said Warnock. 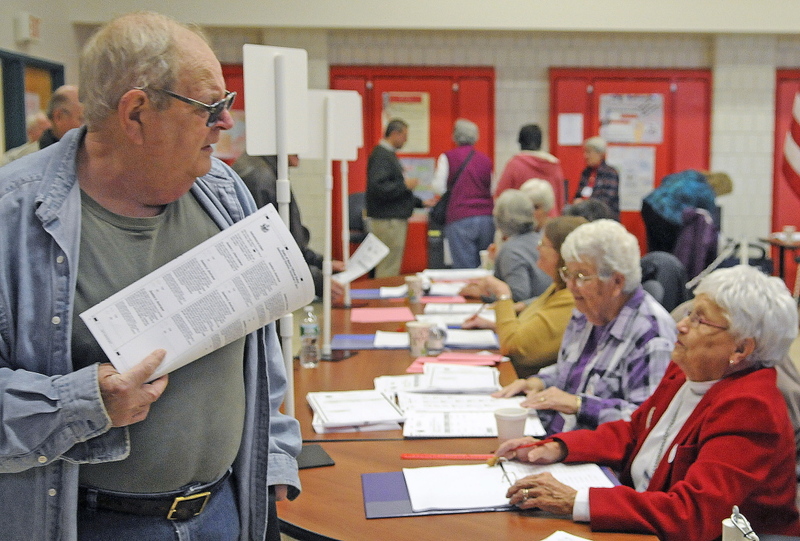 The Maine Democratic Party has been trying to replicate the turnout of a presidential election, which was nearly 70 percent in 2012. 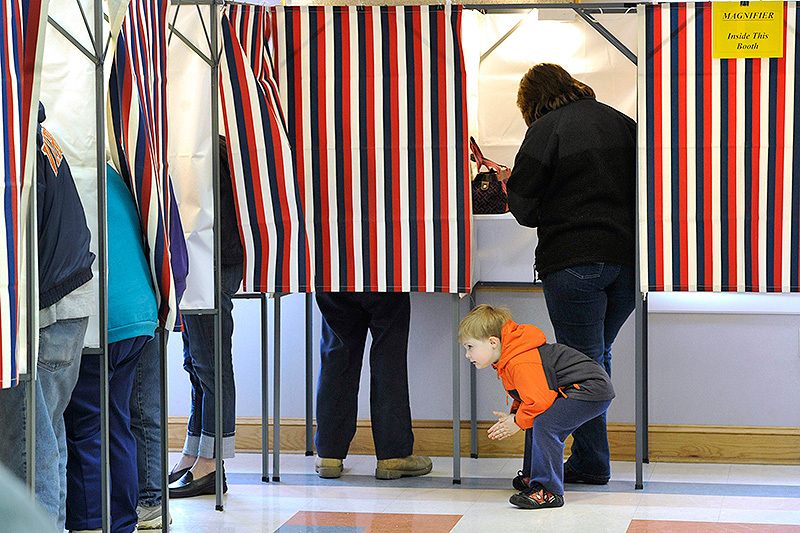 High turnout in southern Maine is also a priority for Democrats. 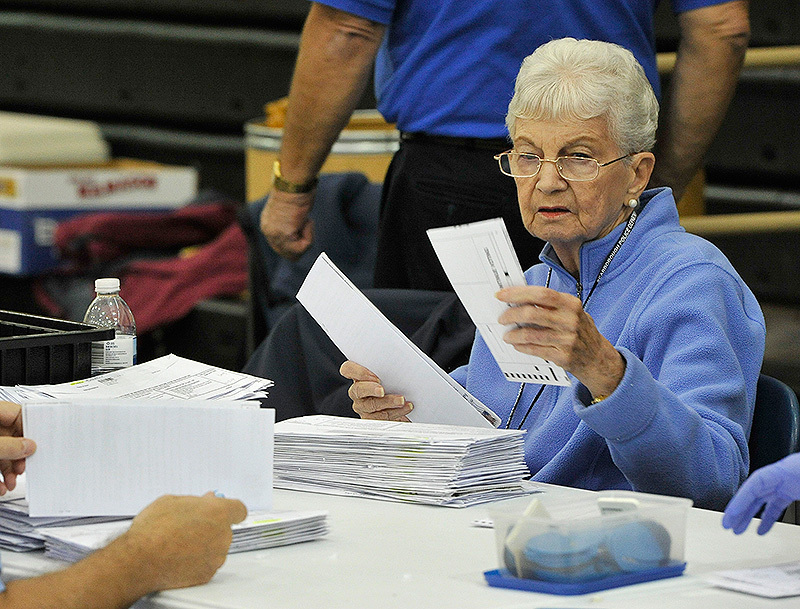 As Portland Press Herald Staff Writer Randy Billings noted, in 2010, nearly half of all ballots cast were in Cumberland and York counties. The bear-hunting debate brought Elisabeth Harding (in white coat) out to vote. 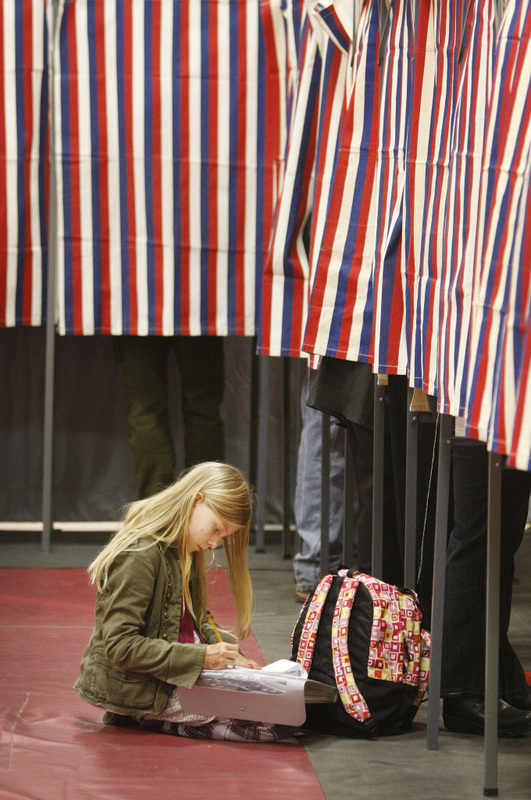 She studies a sample ballot before voting at the Boys and Girls Club in South Portland. 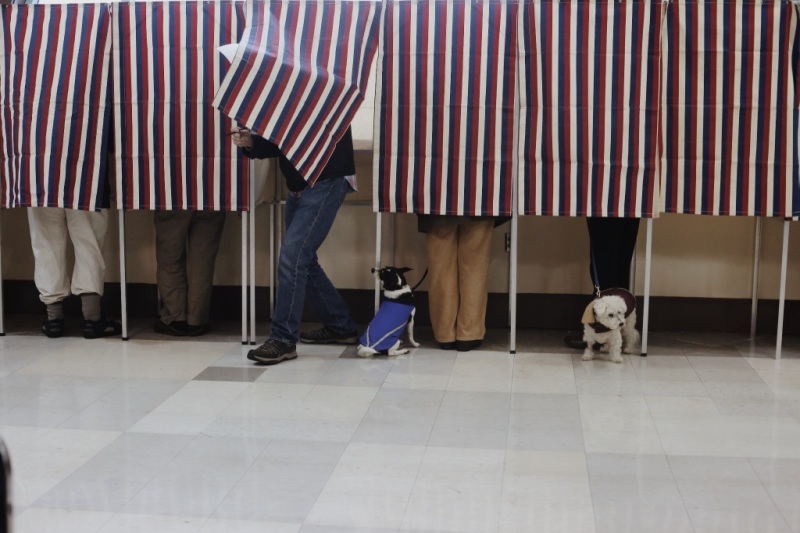 Voters were also deciding a controversial measure that would ban the use of bait, dogs and traps in bear hunting. 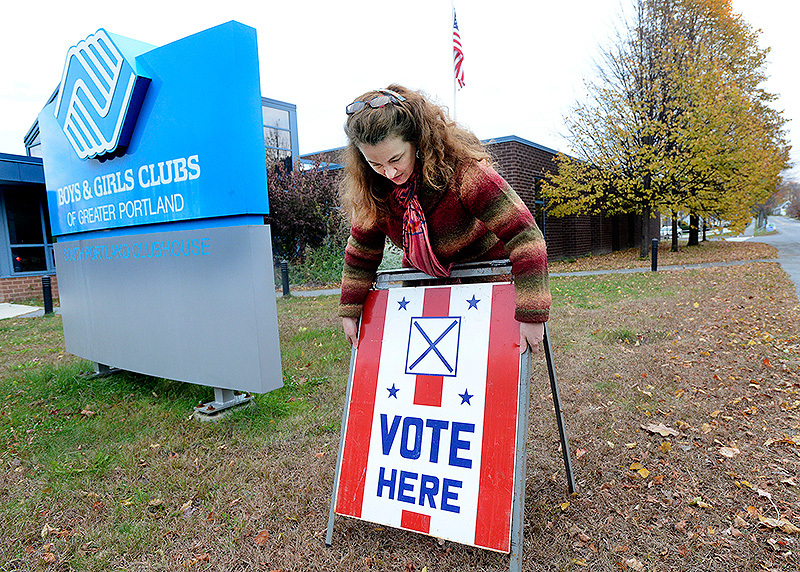 In South Portland, a voter made a silent statement about the referendum, leaving a large stuffed bear at the door to the Boys and Girls Club polling place. On Portland’s East End, where bears have rarely been a problem, several people who waited to vote said the referendum was this year’s top issue for them. 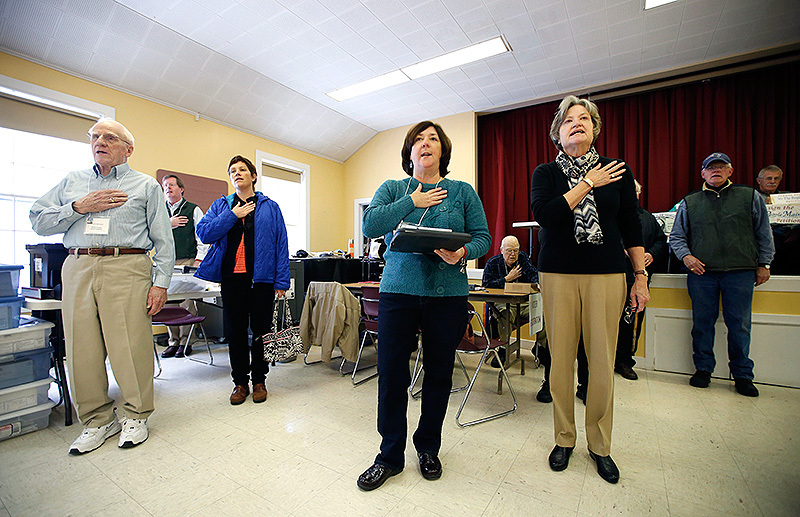 Bonnie O’Brien, 58, said graphic commercials in support of the ban persuaded her to back the change in hunting rules. But Paul Ureneck, 28, a Portland mechanic, said he trusted state biologists and game wardens – most of whom opposed the ban – to make good decisions to manage the state’s bear population. “We can sit and watch the commercials and pass judgment, but they are the ones who are dealing with it,” he said. 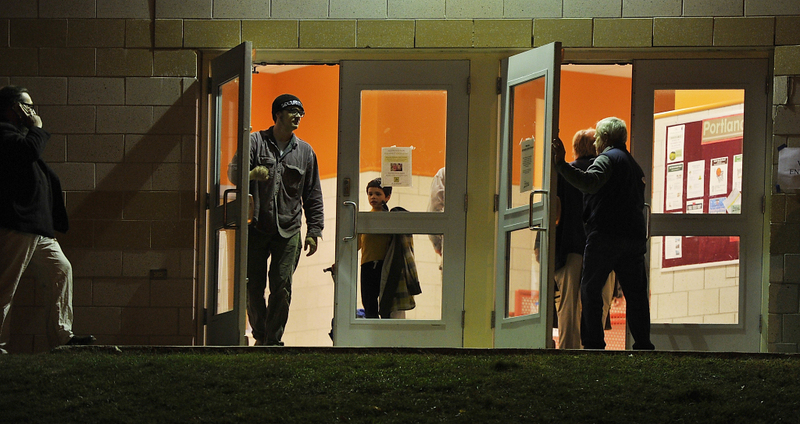 By about 1 p.m., more than 1,000 voters had cast ballots at the East End Community School. 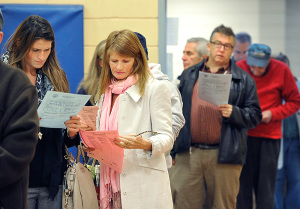 “That’s a very nice turnout,” said warden Denise Shames. 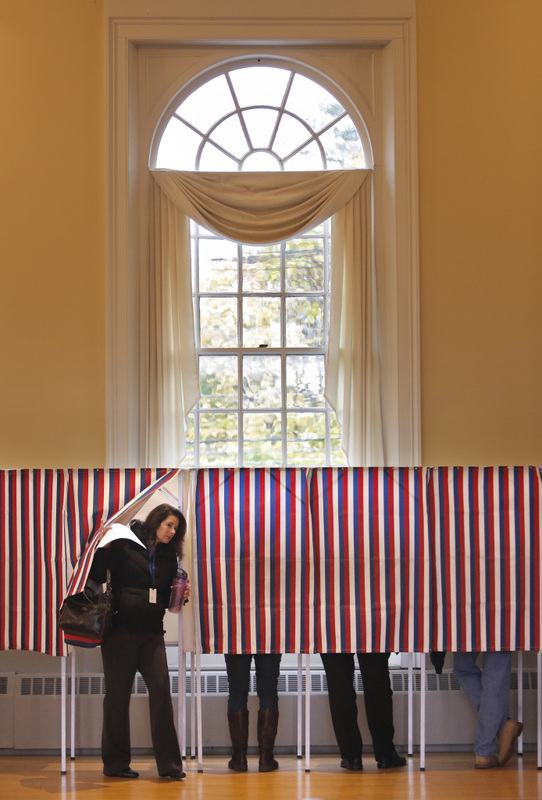 Leaving the polling place, Beshir Mohammed, 52, a Democrat, said the governor’s race was what brought him out to the polls. “We are suffering too much from this governor,” he said. “He kills people indirectly” by supporting cuts to MaineCare. 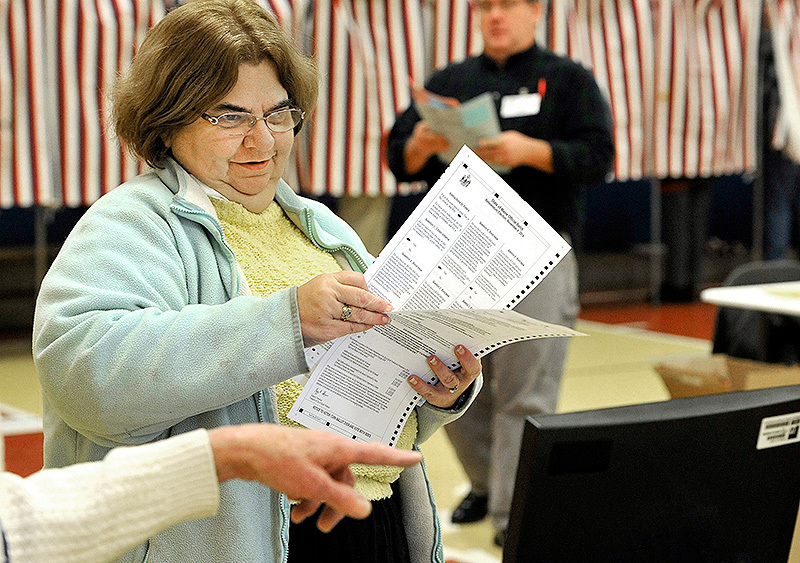 Hinda Rizgalla, 39, also came out to support Michaud, but first she had to register to vote. Originally from Sudan, she got her citizenship last year. 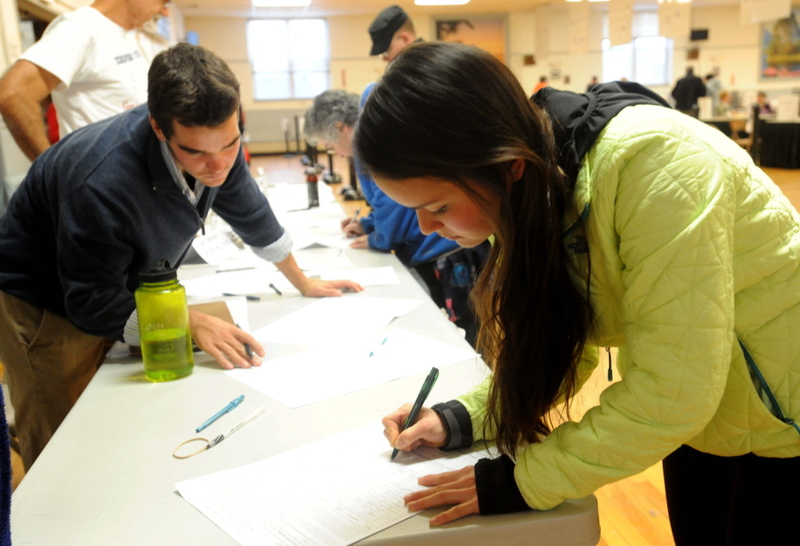 “I want to use my voice for many things,” she said, so voting is important to her. 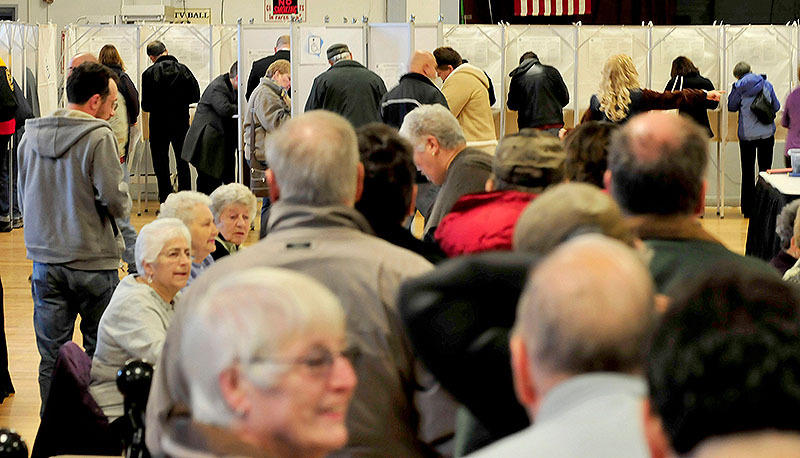 In Maine’s 2nd Congressional District, voters were choosing between Republican Bruce Poliquin, a former state treasurer, Democrat Emily Cain, a state senator, and independent Blain Richardson. 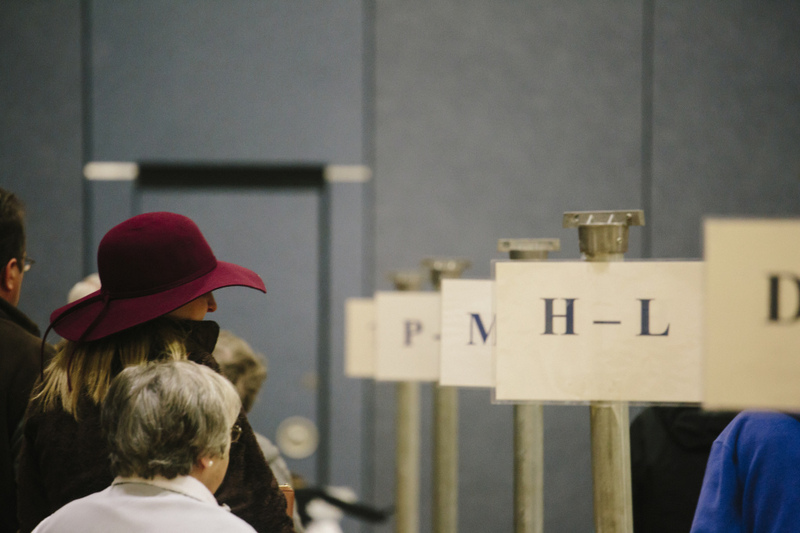 Outside groups have poured money into the race, considered one of only a few toss-up races for the U.S. House. 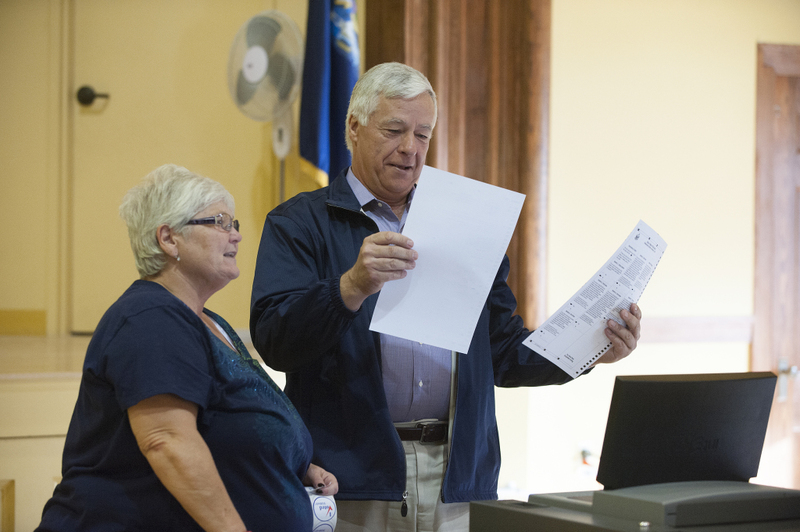 The seat has been held for 12 years by Michaud, who gave it up to run for governor. 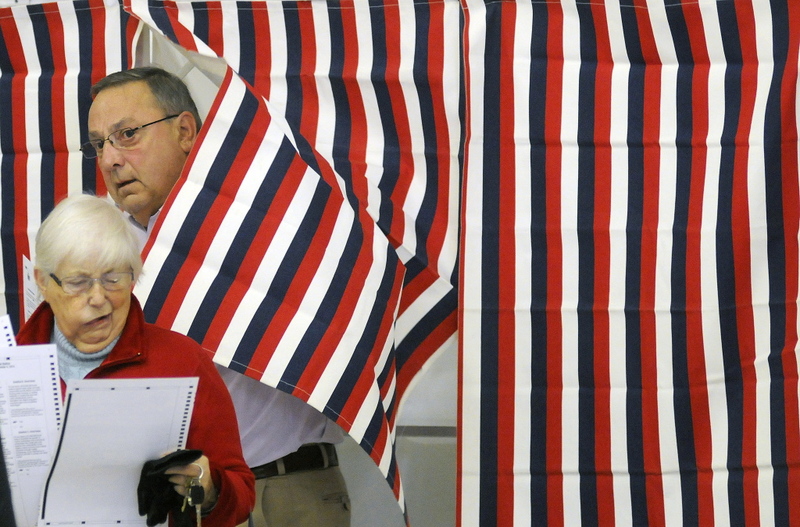 Maine’s other U.S. representative, Democrat Chellie Pingree, is considered likely to be re-elected in southern Maine’s 1st District, and Collins is expected to win her fourth term in the Senate. 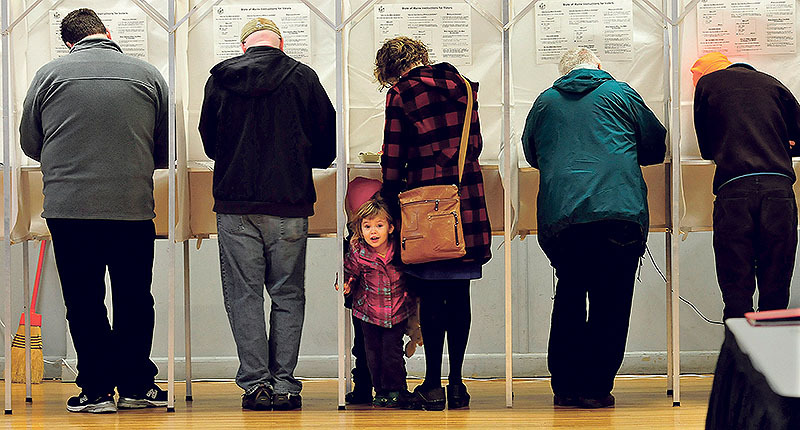 In Lewiston and South Portland, voters will decide whether to legalize small amounts of marijuana for recreational use. 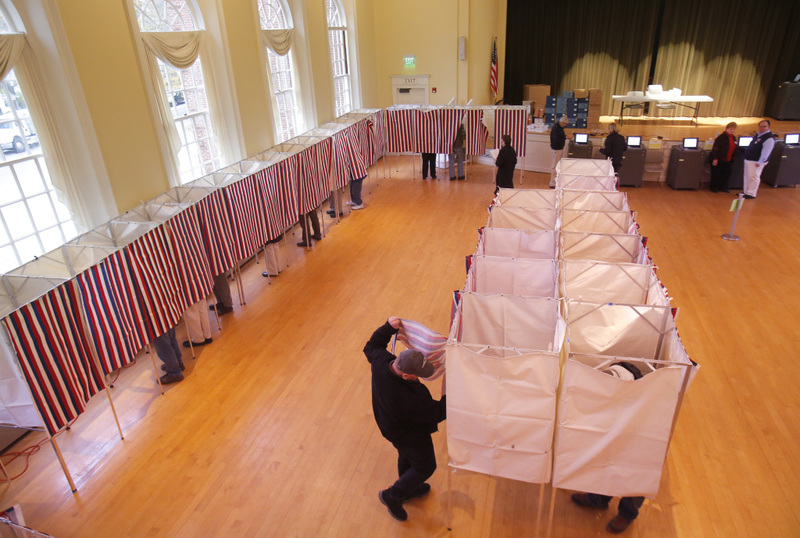 Portland voters approved a similar measure in 2012, but state and federal laws still prohibit recreational use of marijuana. 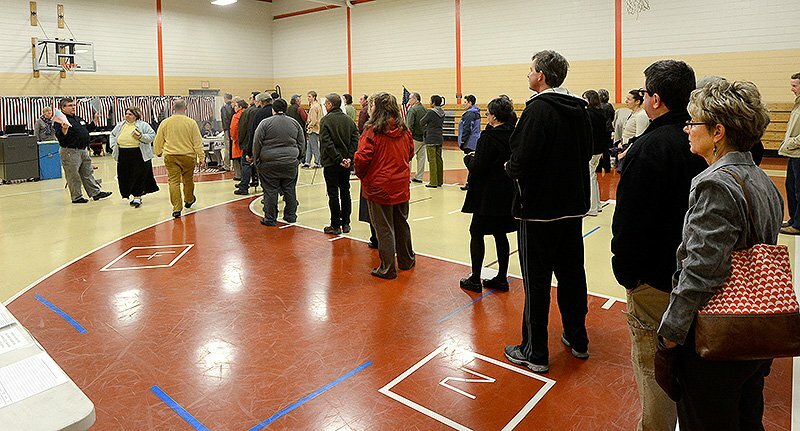 And voters who thought they were done with decision-making in the voting booth had one more choice to make at about 200 polling locations. 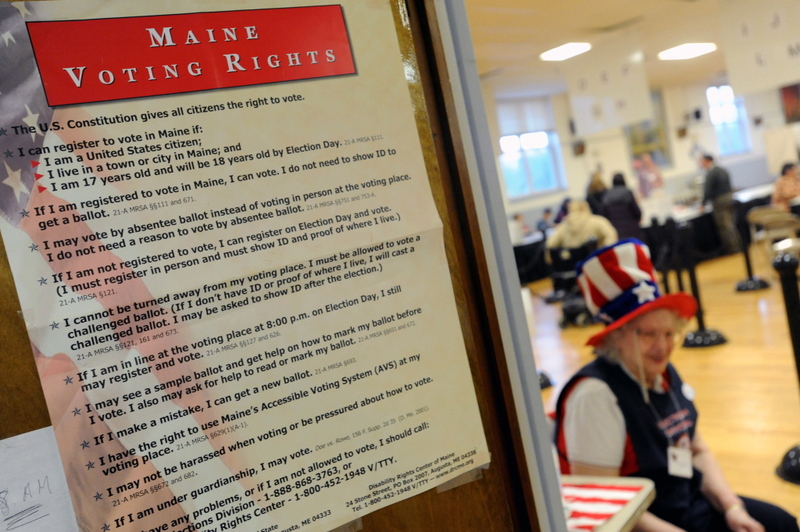 A group called Maine Citizens for Clean Elections was collecting signatures for a ballot initiative that would fully fund Maine’s Clean Election law, require the disclosure of top donors of outside campaign advertising, and require disclosure of fundraising for transition and inaugural committees. Staff Writers Ray Routhier, Bob Keyes and Michael D. Shepherd contributed to this report.